February: Persuaded Business Link Wakefield & District and Wakefield College that the Management Development Forum agenda and resources should be incorporated within the Business Growth Forum. Commentary: The details of ISO 9000 and Investors in People demonstrated clearly how much overlap there was in the aims of the 2 groups. Since there was a considerable commonality of membership, combined with frustration at the agencies’ duplication of effort and resources, it made sense – to me and to the member businesses – that the 2 groups be merged. This was the beginning of a new alliance at operational level between the 2 agencies and a key factor in the development of the BGF. March: The Business Growth Forum profile raised considerably by hosting joint workshop on Kaizen with RHP Bearings (Knottingley, West Yorks). Commentary: RHP were one of the larger engineering firms in the District and one of the most advanced in terms of Total Quality Management. Kaizen concepts were a major revelation to many members of the BGF! The BGF/RHP Kaizen workshop was the first fruit of the new alliance with the College. 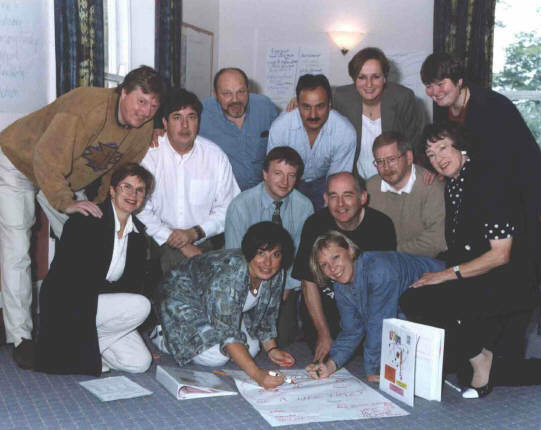 March: Through the Business Link, undertook training in Spiral Dynamics – SD Practitioner 1 Module – with the model’s developers, Don Beck & Christopher Cowan. Commentary: The training programme was brought about by pressure from the Business Link’s Export Development Counsellor Ian Lavan. In pursuit of his NLP Trainer accreditation, Ian had been directed by leading NLP ‘guru’ Wyatt Woodsmall – also prime developer of the concept of meta-programmes – to train in Spiral Dynamics to gain the fullest possible understanding of human motivational systems. The training with Beck & Cowan was undoubtedly a major turning point in my life. Not only did Spiral Dynamics – and the work of Clare W Graves on which it was based – bring a sense of unifying coherence to the bits and pieces of Psychology I had studied from time to time over the years, but understanding of the model gave me a great sense of personal release – freeing me from burdensome and unrealistic expectations. The ways in which I view people and the world around me have never been the same since! April: Elected to Leeds Branch Committee, IQA. Commentary: The local IQA meetings always struggled for numbers and I had been only an occasional attender. I went to their AGM with the aim of introducing the Gravesian approach onto their agenda. Not only did I get them to agree to have a session on Graves/SD but found myself co-opted onto the Committee and stayed on it until other commitments led me to resign in early 2001. I had a great deal of respect for several Committee members – especially secretary David Wade (a freelance quality consultant) – but trying to get them to focus on the real needs of local quality managers (the bulk of the membership), rather than what they thought would be academically stimulating, was an uphill struggle. Sad to say, but attendance at branch meetings did not increase significantly…. April: Business Growth Forum – now renamed the 21st Century Group – monthly meetings now so successful they were running upto 4 hours of an evening! Commentary: With assistant Christy Sullivan doing most of the work on the Calendar, my time was increasingly being dominated by the 21st Century Group and what would become a virtual raft of spin-off activities. April-May: Arranged highly-successful Neuro-Linguistic Programming (NLP)/Spiral Dynamics Change Management workshop programme, delivered for the Business Link by Hidden Resources Change Management Ltd.
Commentary: Hidden Resources’ John Lavan and Business Link’s Ian Lavan were brothers and both NLP Master Practitioners. Ian especially saw the links with Spiral Dynamics and persuaded(!) Business Link to contract Hidden Resources to bring over Beck & Cowan for the March workshops. On the back of that we arranged for Hidden Resources to deliver an NLP/SD-based Change Management programme for smaller businesses, drawing mostly, but not exclusively, from the 21st Century Group. While the Hidden Resources-Business Link relationship might have looked very much like nepotism, it had a profound effect on the development of the 21st Century Group. During this time Ian was acting much as a mentor to me, helping me embed the changes the Beck & Cowan workshops had wrought and nurturing my fledgling interest in NLP. Such was my regard for his care towards me that, for a while, I openly referred to him as ‘guru’ and myself ‘disciple’. May: Attended Investors in People Update Workshop. May: Completed design and development of template Ultimate Total Quality System for nursing and residential homes, benchmarked against ISO 9000, Investors in People and the European Foundation for Quality Management’s Business Excellence Model. Trialled the system with Radcliffe Gardens Nursing Home. Feedback extremely favourable. Commentary: I took the ISO 9000 template system I had designed for IBS 2 years earlier and turned it into a quite different beast altogether. The sheer amount of material in the package meant that a care home could be assessed against any or all of the 3 standards. I found over the next year or so that if I could actually get the Ultimate System in front of a home owner or manager for a demonstration, they would invariably buy it. However, I just became so busy with other activities – mostly to do with the Business Link – that I never marketed the product properly. Consequently I only sold around a dozen copies. I held talks with 3 larger consultancies interested in taking the Ultimate System on but they were all inconclusive. When both the Investors in People and the ISO 9000 standards were revised significantly in 2000, I hadn’t the time or energy to give to a major upgrade. By that time the ‘quality boom’ in the care homes sector was starting to fade and I decided to take the System off the market. However, for several years afterwards, I used some of the template materials from the Ultimate System when helping clients set up the basics of a documented quality system. June: Sold second copy of Ultimate System. The home manager contracted me for the first phase of a full scale change management programme with ongoing coaching for her. Commentary: Relatively new in post, the manager was determined to turn a dreadful home into an excellent one. However, she severely underestimated the opposition to change from the owners who drove her out shortly after we submitted the change plan. June: Pioneering nature and outstanding success of 21st Century Group led to Business Link Wakefield extending my contract. July: Two further copies of Ultimate System sold. July: 21st Century Group received influx of new members (from April-May Change Management Workshops), including some from service sectors, and took on overt Change Management agenda. July: Used Graves/Spiral Dynamics and NLP to assist ‘old-era’ senior manager in a large company to adjust to reactionary changes in organisation. August: Joined Hidden Resources NLP Practice Group which I attended sporadically until moving to Beverley in Spring 2000. September: Used Graves/Spiral Dynamics and NLP to assist the manager of Woodlands to adjust to changes being brought in by the Multiple Sclerosis Society. Commentary: Manager Vanessa Lindsay-Smith had done a wonderful job – under some quite difficult circumstances – of turning Woodlands into a world-class respite care centre. However, new centralising tendencies by the Society threatened to undo some of her hard work in establishing an excellent volunteer management committee. By cluing Vanessa into what motivational systems (vMEMES) were at work, she was then able to mitigate some of the worst effects of the Society’s centralisation and keep her management committee together and motivated. September: Completed competence-based INLPTA-certified NLP Diploma staged (at the instigation of Ian Lavan) jointly by Business Link and Hidden Resources. Commentary: Still on an incredible buzz from Beck & Cowan’s Spiral Dynamics training, I found that the NLP models fitted almost seamlessly with those concepts and enlarged my understanding considerably. September: With my contract extension up, Business Link agreed to me carrying on facilitating the 21st Century Group on a sub-contract basis. They also asked me to run a new part-time Business Link office in the SESKU/Hemsworth area. Commentary: The funding stream Business Link had used to pay me had simply ceased to exist so there was no choice other than to let me go. One evening after everyone else had left the building, I entered manager Kate Dallas Wood’s office and sat in her seat, one hand resting on her ‘urgent’ pile and the other on her PC mouse. I then asked myself what was it like to be her, what pressures was she under and what could I do to help her. The insight was remarkable! The next day I gave her my proposal to run the 21st Century Group as a sub-contractor. My new relationship with Business Link then established, Kate and lead business advisor Steven Beevers next asked me to man the SESKU/Hemsworth office. These 2 Business Link contracts provided steady work while also allowing me time to develop my own own consultancy work and (theoretically!) market the Ultimate System. September: Approached by Hidden Resources to work with them on a project-by-project sub-contract basis. Commentary: I did do bits and pieces for Hidden Resources – most notably on the HemsMESH project. For more than 2 years Christopher Cooke and I debated terms for me to come into Hidden Resources on a more committed basis. However, we could never quite agree terms. Then he and John Lavan went their separate ways! September: Started Investors in People project with St Lukes Nursing Home (Leeds) as a referral from Radcliffe Gardens. October-November: Carried out Gravesian/NLP-based management training for Stelram Engineering Ltd (Ossett, West Yorks) as sub-contractor to Business Link Wakefield. Commentary: Stelram boss Jack Holt was one of the most remarkable men I ever met, epitomising just about every aspect of the RED vMEME – both good and bad! A engineering genius of sorts who could make just about anything, he ran his small-but-fast-growing company with a rod of iron. A big gruff Yorkshireman with a real passion for life, he was opinionated and short-sighted. Yet, by sheer force of will, he drove Stelram ever-closer to the big time. Jack was opened up to learning and became a leading light in the 21st Century Group – indeed a champion for it! He brought much back from the Group into his thinking on how Stelram should develop. My brief was to help the family-run company develop an organic middle management structure, thus increasing its capacity for growth. However, Jack, typical of Ichak Adizes’ (1987) ‘Founder’, found it incredibly difficult to let go emotionally of ‘his baby’. November: Facilitated ’25 Tips for Better Bed-Filling’ workshop for Leeds Care Homes Association – so successful, asked to submit proposal for entire Workshop programme on this and related themes. 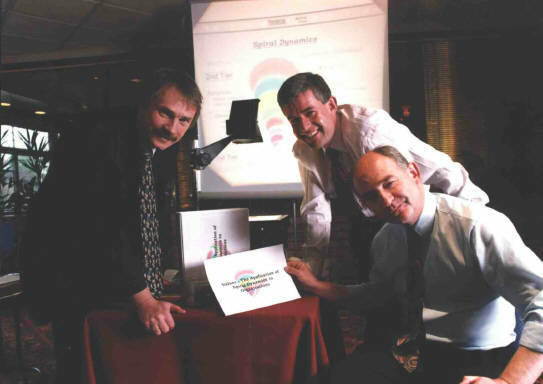 December: Undertook further training in Spiral Dynamics – SD Practitioner 2 Module – with Beck & Cowan. Commentary:v By the time they returned to Britain, Beck and Cowan were barely on speaking terms and were well on their way to ending their partnership. (See the Blog post: Fare Thee Well, Christopher Cowan for more on their split.) Their dysfunctionality was so great it was like attending 2 different courses in the same room. Even so the experience still furthered my interest in Spiral Dynamics. December: Commenced full-scale Total Quality Management project for Westward Care (Yorkshire) Ltd at Pennington Court Nursing & Residential Home (Leeds), based on the Ultimate System – but also using the Gravesian approach to take a values-based look at staff culture. Commentary: Westward Care boss Peter Hodkinson – also a leading member of the Leeds Care Homes Association – was another remarkable man avaricious for learning. He developed so much as a leader over the following months that he realised he could develop the capacity in-house to do much of what I was doing for him. When I became temporarily ill, he simply took greater control of the project!